Reflections of a more personal nature on my commitments and contributions are available on this page. I hope you enjoy them. “Why I write with Reggie” explains the leisure I have been given and put to good use. “Getting Hooked” describes how I came to write with Reginald Foster our series of books on teaching and learning the Latin language. 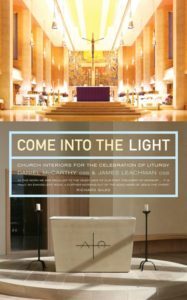 “Come into the Light” is a book on church architecture and art designed for the celebration of liturgy. Here is the volume Come into the Light, which is available through the gift shop of St. Benedict’s Abbey.